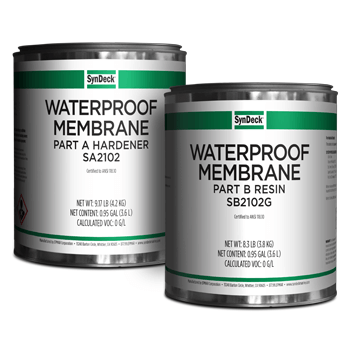 SynDeck® Waterproof Membrane SS2102 is a 100% solids, marine waterproof epoxy membrane coating applied to steel, composites and sealed wood surfaces. This polyurethane hybrid is used to waterproof marine flooring. It is typically specified as a resilient water barrier applied to SynDeck underlayments, steel, composites and sealed wood surfaces. This two-component product has excellent chemical and moisture resistance. It is a user-friendly product with good leveling properties and is 0 VOC. When applying over porous substrates, a sealer coat is recommended. Qualified to ANSI 118.10.